From the leaders in mixed flow technology comes the next generation of waterjet propulsion. Purposely designed and engineered for demanding, high speed applications, the X Series is the product of our expertise and experience, resulting in a premium pump that improves performance and efficiency. Taking the highly successful and proven MJP product range one step further, the X Series provides users with more power in a lighter unit that burns less fuel and extends range over comparable alternatives, thereby reducing cost of ownership. Meet the X Series, you’ll be glad you did. The cast aluminum bucket has been designed for decreased stopping distance and increased maneuverability. With its new narrow design, center-to-center installation placement is minimized and the mechanical tie bar synchronizes steering with the helm pump. The new hydrodynamically designed steering fin gives superior responsiveness and steering efficiency, all while eliminating dead band. Combined with a balanced steering nozzle for small maneuvering forces, enables control by hydraulic helm pump. Fitted under the waterjet, the interceptor placement has been carefully integrated to complement the jet design. Its strategic location maximizes stagnation pressure under the hull, generating greater lift. (Additional interceptors can be fitted on either side of the jet). The all inboard integrated hydraulic system features separated seals for water and oil. This provides superior corrosion resistance and eliminates the risk of external oil spills, making the X Series compliant with clean water regulatory requirements. The superior high-speed characteristics of the pump allows optimized intake at lower speeds, thereby developing optimal performance over the complete speed range, without impacting top-speed capabilities. The unique technology behind the X Series reduces power demand by up to 20 % - enabling manufacturers to select lower installed power without increasing displacement. Designed for applications in excess of 50 knots with improved efficiencies. 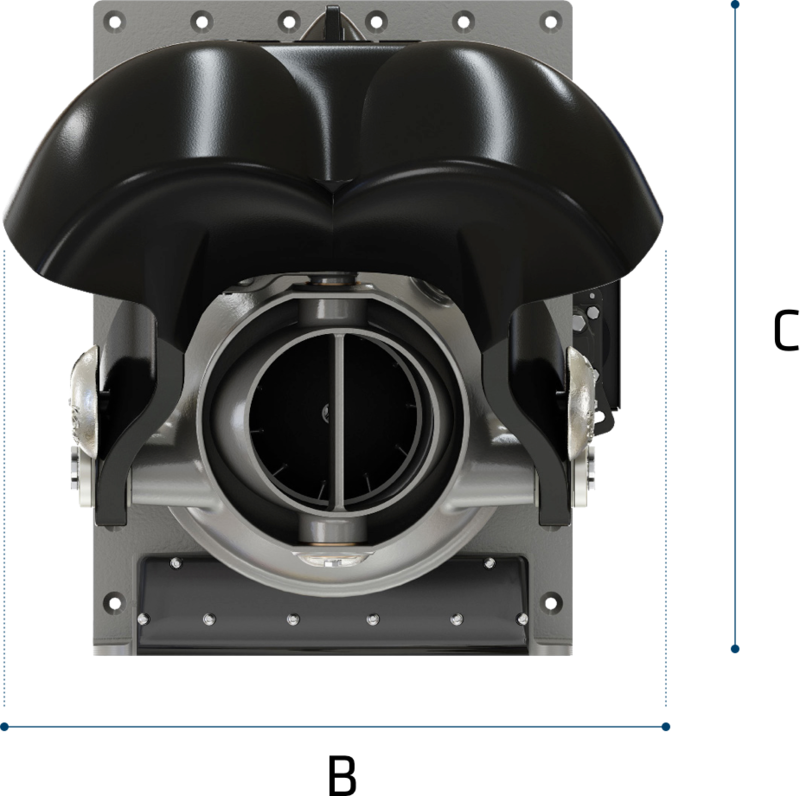 The X Series is a true mixed flow pump making it possible to select a smaller jet, thereby reducing the weight by up to 10 % compared to axial flow jets. The X Series has an optimized footprint that allows for greater flexibility in boat design and building. Its compact design offers one-piece installation making mounting to the hull as simple as bolting on or welding in. All hydraulics are pre-installed, no need for additional equipment or piping. Designed with maintainability in mind, the X Series features an aft of transom inspection hatch, making it possible to inspect the pump without risk of water intrusion into the hull. MJP is known for our commitment to quality. That’s why the best-in-class MJP five-year warranty comes standard with the X Series. It’s our promise to you – unmatched quality, unsurpassed service and an unequaled customer experience. We make it our business to keep your business running. This unique technology reduces power demand by 20 percent compared to rival offers, enabling the manufacturer to select lower installed power without increasing displacement. For operators, this translates into speed and efficiency. The MJP X Series features our proprietary mixed flow pump – ideal for applications well in excess of 50 knots. 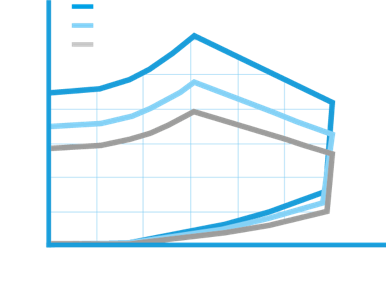 Taking into consideration the vessel’s resistance at the desired speed, use our thrust envelope diagram as a guide in determining which X Series model is best for you. Thrust figures shown are for a single waterjet. For a twin installation, thrust is doubled.